Microwave cooking in a cup is surely the most delightfully lazy way to weave culinary magic, and it's a technique that Domestic Sluttery has already elevated to an art form with the frankly Mensa-membership-worthy Emergency Jaffa Cake. 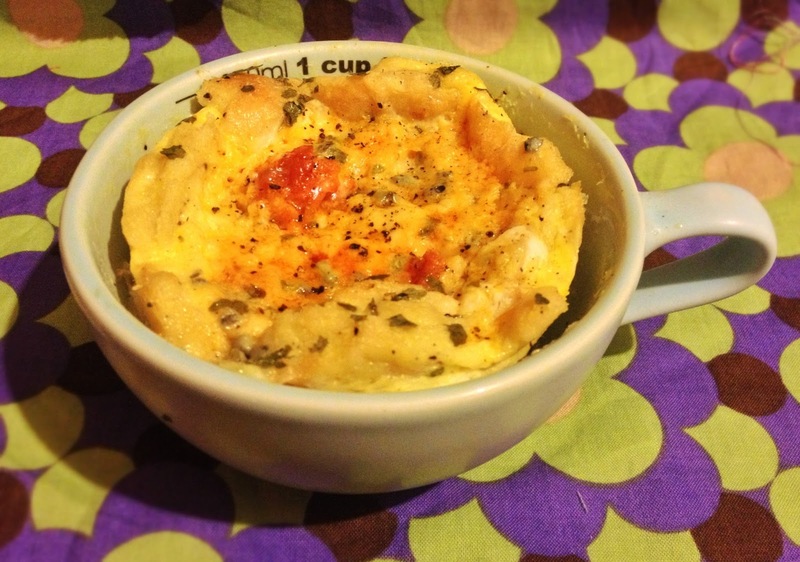 I'm peeking out from the shadow of its mighty wings with this cup quiche, which gives you a tasty tea in oh, around four minutes. Don't expect it to taste exactly like quiche - hello, there's no pastry for a start - but do get your tastebuds a-tinglin' for hot, eggy, blue cheesy, bready, chorizooey (Deschanel) GOODNESS. It is marvellous. I had two in one sitting. Feel free to mix up the recipe and chuck in whatever ingredients you have lying around - vegetables work well, and any kind of cheese can be used. If you're using a non-creamy cheese, I'd add a scant tablespoon of cream to add some oomph. In a cup, beat the eggs and milk until mixed. Season with a little salt and pepper. Add the bread pieces, tszuj it around in the egginess a bit, and then throw in the chorizo and cheese. Poke at these until they're more or less covered with egg. Sprinkle with parsley, then microwave for 2-3 minutes, depending on your MICRO-POWER! Keep a close eye on the cup as it spins around, lest the egg comes whooshing over the sides. The middle will look set once it's done. Obviously. Smugly eat, while surveying the (almost) zero washing-up. This is genius. You are genius. I want to add some chopped tomatoes and chilies and tabasco to make an instant eggs-in-purgatory thing. Oh, the addition of toms/chillis/tabasco is a great idea. I would also leave out the bread for a low-carb snack. Droooool! Mmm - they would be delicious additions. I know what I'm having for lunch today!